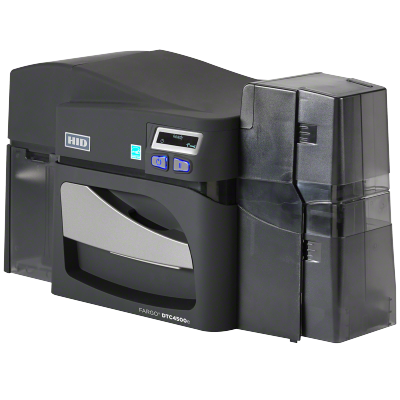 The DTC4500e combines high security and convenience to easily print what you need. The versatility of the DTC4500e is unsurpassed. Driven by an extremely robust and reliable print engine, this high-volume printer delivers speed, power and versatility rolled into one. 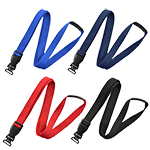 High-capacity ribbons enable the DTC4500e to print twice as many full-color cards as most printers before the ribbon has to be changed, providing continuous high-quality card printing and encoding. Built-in security with password-protected printer operation and fluorescent panel printing for a cost-effective and dynamic increase in card security. 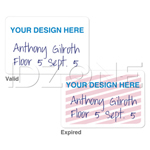 SmartScreen™ graphical display provides easy-to-follow prompts so you’ll always know printer status. Standard dual-input card hopper increases capacity or management of multiple card types. Easily integrates into existing IT infrastructures through the built-in Ethernet and USB connection, allowing for centralized or remote ID card issuance. FARGO Workbench™ diagnostic utility facilitates printer maintenance. Its Color Assist™ tool matches spot colors. ensuring accurate prints of graphics, such as company logos. 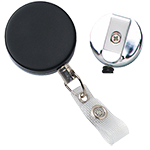 Increase security with optional locking card hoppers. The FARGO® DTC4500e is built with Genuine HID® technology and is fully interoperable with other products in the HID ecosystem, enabling organizations to leverage their existing technology investments. High-volume performance –Built for organizations requiring robust, high-volume printing every day. Standard features include high-capacity ribbon supplies and dual-input card hoppers that allow for maximum card input capacity and management of multiple card types. End-to-End Control, Flexibility and Security –The optional iCLASS SE® encoder (part of the iCLASS SE open encoder platform) can be fully integrated into your printer, allowing you to create, encode (read/write) and manage your secure credentials from start-to-finish. 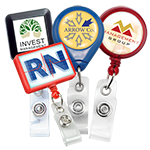 Design personalized ID badges locally and then program them to work with your current physical access control system (PACS), streamlining your ordering, inventory management, and issuance processes. Highly versatile –The modular design enables organizations to build on their investment by adding field-upgradeable modules for dual-sided printing, lamination and technology card encoding. 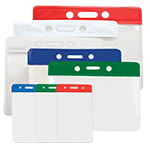 Maximum protection – Protect blank card stock and printed/encoded cards with optional locking card hoppers. 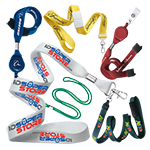 Earth friendly – ENERGY STAR® certified for efficient energy consumption and eco-friendly (ECO) refill ribbons. To maximize card quality and your Fargo printer's life expectancy and durability, use only genuine Fargo products.